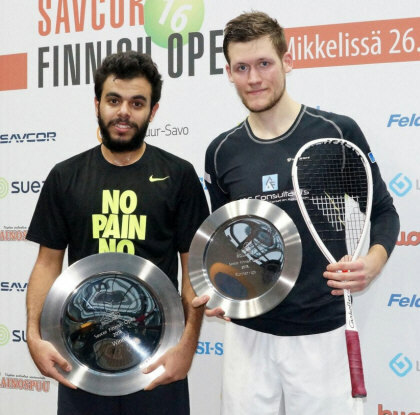 Shehab Essam from Egypt was crowned Finnish Open Champion on Sunday in Mikkeli. In the final Essam beat Geoffrey Demont from France in a tough and hard fought match. The match started very evenly with both players scoring one after the other. This continued to the end of the first which Demont won 16-14. The second game started with Demont taking command and a 6-3 lead. Essam was not happy with some of the referee’s decisions and his game was ruined for the rest of the game. Demont continued to lead the match in the third. He reaached a 7-4 lead, before Essam got back into the game. Point by point he cam e closer and finally won the game 11-9. Essam’s command continued in the fourth although Demont still hang in there. Game 11-9 to Essam and the match went to a deciding game. Now Essam was in command and Demont was unable to threaten the egyptian. 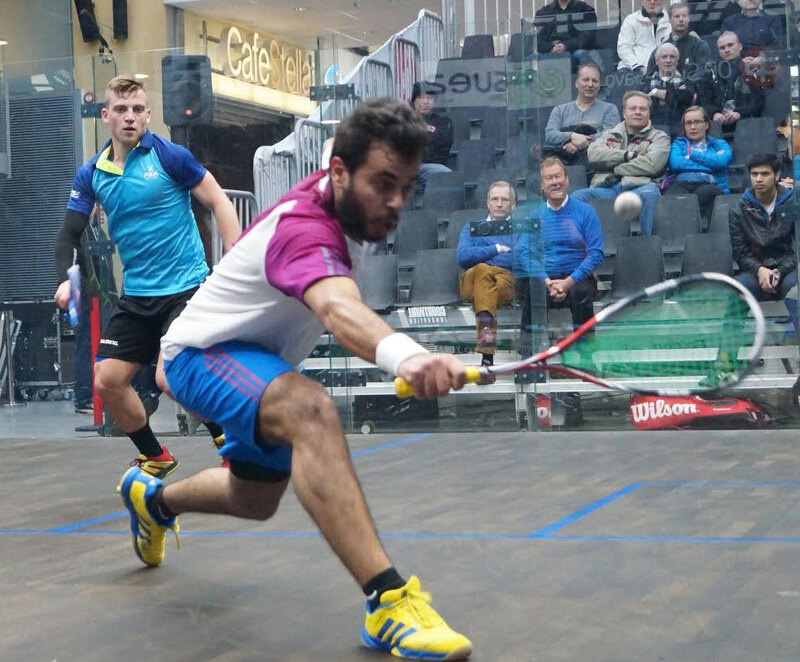 Game 11-5 to Essam, and a first PSA title for the world #100. 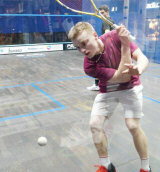 The Finnish Open has reached the semi finals which were played today on the glass court at Stella shopping center. Top seed Shehab Essam from Egypt had recovered well from the quarters where he beat Pakistan's Asim Khan in five games. Semifinal opponent David Poleshchuk from Israel had a much easier match in the quarters, but that didn’t seem to help. 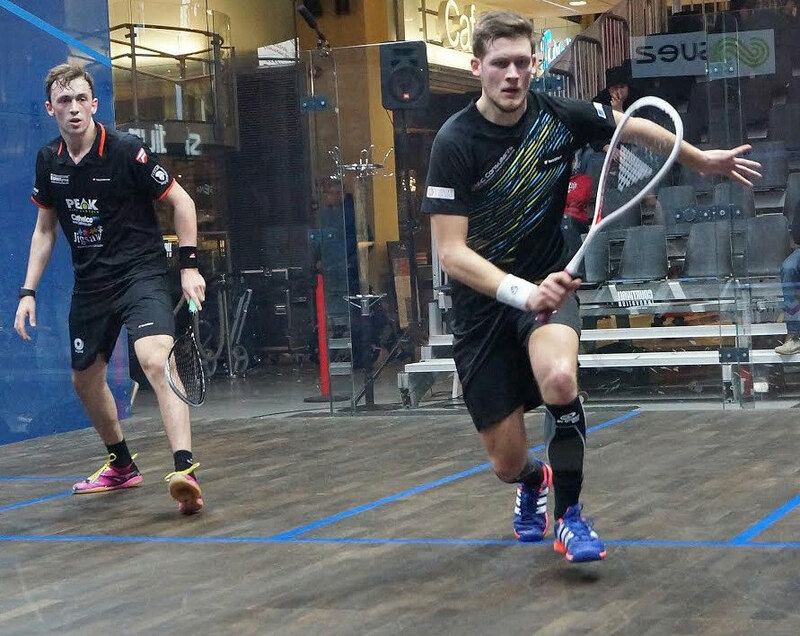 Essam started strongly and took an early 6-2 lead but Poleshchuck came back and nearly levelled the score at 7-8. That was how far he came. 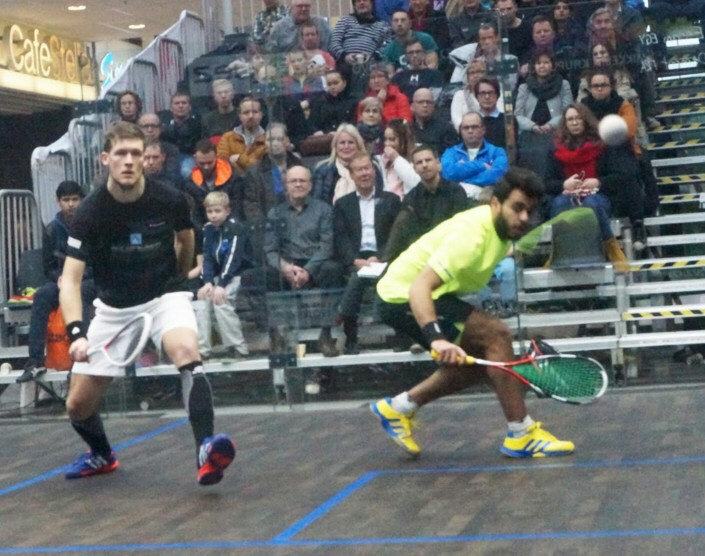 Essam took the first 11-8 and dominated the match from there on. In the second semi final England's Ashley Davies strarted with a good pace and cruised to take the first game 11-4. Frenchman Geoffrey Demont kept cool and came into the second game well concenrated. He got the game under control and point by point Demont proceeded towards a 3-1 victory. The Äijänens were not able to produce the same standard as in the first round. Miko Äijänen was at times able to press England's Ashley Davies, but did not manage to make use of it. A 3-0 victory took Davies to the semi finals. Older brother Jami Äijänen was far from yesterday’s standard. 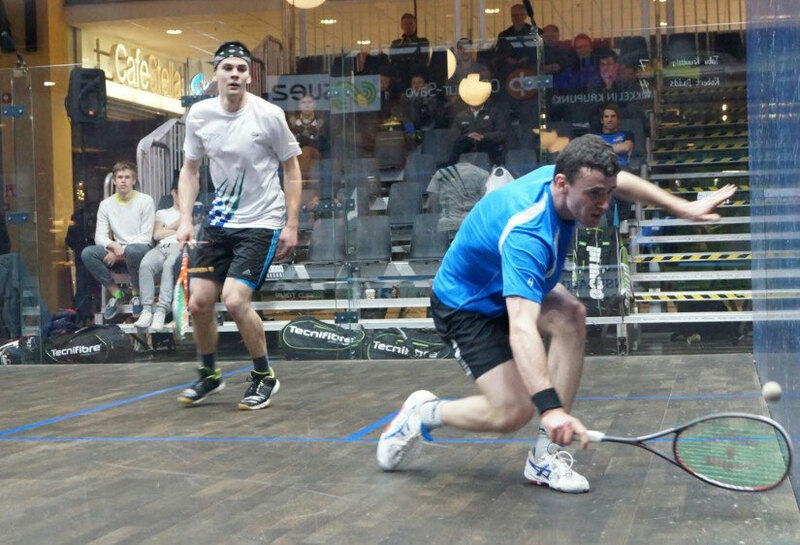 Frenchman Geoffrey Demont had control for most of the time and a 3-1 victory secured him a place in semis. Israel's David Poleshchuk did not give any chances to Switzerland’s Manuel Wanner, although he lost one game. Topseed Shehab Essam from Egypt looked to take the match against Pakistan's Asim Khan in straight games but that was not to be. Khan came back after teo games down and was only defeated in the tiebreak of the fifth. 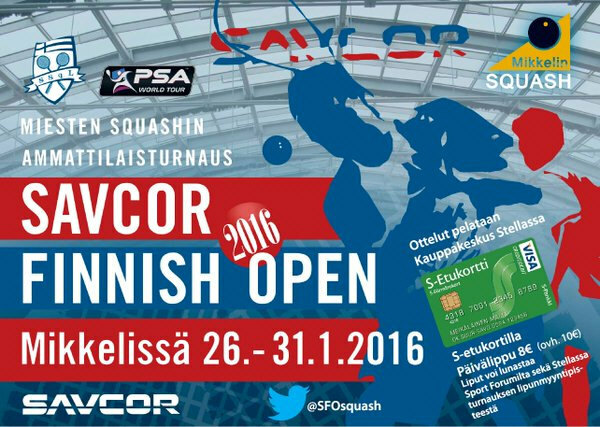 The Äijänen brothers Jami and Miko survived the first round in the Savcor Finnish Open in Mikkeli. Older brother Jami got a wild card for the event and came up agaista 7th seed Baptista Masotti from France. Jami played one of his best matches and Masotti did not find ways of stopping Jami. Younger brother Miko came from the qualification and was drawn against 2nd seed Aqeel Rehman from Austria. Few thouht Miko would have a chance, but fortunately Miko did not think so. The scores were even and a tiebreak in the fith was needed to decide the winner. A good win for Miko and a place in the quarter finals. Bradley Masters and Roshan Bharos had the honour to kick off the qualifying finals on Wednesday in Mikkeli, Finland. Masters started strongly and took an early 7-2 lead before Bharos got into the game. He took eight of the ten next points and got game ball. That was not enough as Masters clinched the game 12-10. The second game started with Masters dominating and at 5-1 Bharos through in the towel with an injury. The second match was much awaited by the Mikkeli crowd, but the beginning did not look very good for the Finn Tatu Kmuutila. Englishman Robert Dadds took the first two games and looked the stronger of the two. The third game was still dominated by Dadds, but at 4-7 Knuutila found a new rhythm and took point after point and the game 11-8. In the fourth game Knuutila was in the driver’s seat and he leveled the match to two games all. The fith was on it’s way to go to Knuutila but at 45-6 it was Dadds’ turn to find a new gear. This took him to match ball at 10-6 and after three saved match balls by Knuutila Dadds took the match and a place in the main draw. The last match of the night was between country- and clubmates Miko Äijänen and Ville Karsikas. There was never any doubt of who was going to win the match. Äijänen eased the pace after the first game but made sure he stayed that much ahead that he could win in three games.